The University of Virginia’s McIntire School of Commerce ranked second and Cornell’s Dyson School of Applied Economics and Management ranked third. To rank the programs, Bloomberg Businessweek used nine measures, including surveys of both senior business majors and employers, median starting salaries for graduates and the number of alumni each program sends to top MBA programs. A calculation of academic quality is also included in the methodology, combining average SAT scores, student-faculty ratios, class size in core business courses, the percentage of students with internships and the number of hours devoted to class work. This year, 145 undergraduate business programs participated in the ranking. Twenty-one were eliminated because of insufficient response rates in the student survey, employer survey or both. The Mendoza College of Business currently enrolls 1,928 undergraduate students in six majors: accountancy, finance, marketing, management consulting, management entrepreneurship and IT management. 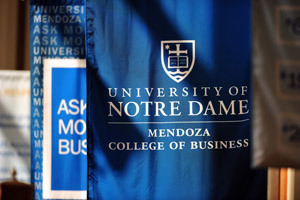 After completing the University’s innovative First Year of Studies program, Notre Dame business majors enter the Mendoza College in their sophomore year. The Mendoza College also offers graduate degree programs — including a Master of Business Administration, Executive Master of Business Administration, Master of Science in Accountancy, Master of Science in Business and Master of Nonprofit Administration — as well as non-degree executive education and nonprofit professional development programs. Originally published by Carol Elliott at news.nd.edu on March 20, 2013.